Emma's Soap • Handmade in Devon, Jojoba Oil 'The Complete Bar' Shampoo & Soap, The Complete Bar with Jojoba base oil, is shampoo and soap in one bar, it nourishes & soothes the scalp and skin. Essential oil combination of Lavender and Rosemary which stimulate the hair follicles. Suitable for normal hair. Fresh & Uplifting Shaving Soap - The Complete Bar - Working Hands. The Complete Bar with Jojoba base oil, is shampoo and soap in one bar, it nourishes & soothes the scalp and skin. Essential oil combination of Lavender and Rosemary which stimulate the hair follicles. Suitable for normal hair. Emma has added Organic Cocoa Butter to help condition the hair. The user may wish to use an additional separate condition to compliment. How to use: Wet hair, work up a lather in hands, transfer to hair in sections, continue until all hair is washed. Using less obtains better results. Rinse throughly. For more information of this bar and what others are saying click here. Ingredients: Sodium olivate (Extra Virgin Olive oil), Aqua (Water), Sodium sweetalmondate (Sweet almond oil), Sodium cocoate (Organic Coconut oil), Saponified (Jojoba oil), Cera alba (Beeswax), Glycerine, Juniperus virginiana (Cedarwood oil), *Lavandula angustifolia (Lavender oil), *Citrus sinensis (Orange (sweet)oil). *Rosmarinus officinalis (Rosemary oil). *Contains Limonene, Linalool, Natural constituent of essential oils listed. Every business decision made, from manufacturing, waste, deliveries are made with an environmental sustainable conscience. 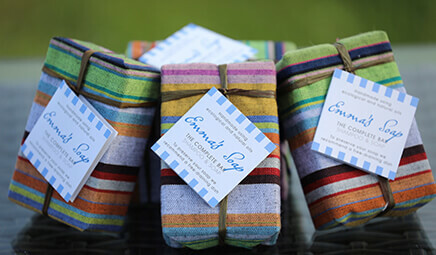 Emma's Soap endeavours to ensure that all its products are from ethically sustainable sources. Postage from £3 for up to 9 bars. Free UK Delivery on orders over £35. Hand made in Devon, England, wrapped in Organic fair trade cotton, no petroleum or mineral oil, no parabens or artificial fragrances or colours, no sls’s or slr’s no palm oil. Just wanted to say thank you for your lovely unscented Avocado soap, it has really helped my hands heal! I have just ordered some more and some for another friend whose hands aren’t feeling very happy. My lovely girlfriend Emma has some challenging eczema issues, thank you or recommending your Avocado unscented soap. I bought some soap off you at Quest, I have Eczema and your soap is amazing! I just wanted to say a big thank you for our lovely wedding favours. All of our guests loved them and lots commented on the delicious scents. They looked lovely set up on the tables. Just a wanted to say a huge thank you for your excellent service. I ordered three soaps early on Wednesday, and they arrived yesterday! More to the point, I jumped straight in the shower with the cocoa butter soap, and it is absolutely lovely! I have never seen more beautifully presented soaps! I received a bar of your soap as a Christmas present; it is one of the loveliest presents I have received this year. The wholes idea is just wonderful and I want to say thank you so much. I have read the label and will re-use my fabric, love the ethos. I will tell all my friends about you. After extensive searching I have not found anything to compare with the quality and obvious love and care which goes into your product. I am so impressed with the environmental attitude you apply to your whole process of soap making (not to mention how lovely they are) that I feel inclined to tell you that you are fabulous and so are your soaps! My husband recently purchased a number of your soaps because you do not use palm oil in your production process and, like you; we are immensely troubled by the destruction of these vital landscapes. I was really impressed with the packaging, scent and overall gentleness of the product. Your company ethos is extremely appealing to me as is the fact you are a Devon based entrepreneur.